As reported: "To me, the worry that there is going to be a glut... I don''t think that will happen. 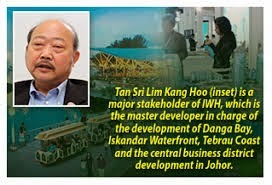 The developers are deep-pocket enough to hold back their launches, if need be," said Iskandar Waterfront Holdings (IWH) chief executive Lim Kang Hoo, one of the early backers of the Iskandar project. Mr Lim was voted by Forbes this year as Malaysia's "newly-minted billionaire" on the back of the Iskandar property play. "Given their experience in Chinaand in other parts of teh world and the size of the Iskandar economic zone, they will be the first to know if there is a glut in the area and would be smart enough to hold back or stagger their launches," he said. Our reaction: We sure hope that Tan Sri Lim is right, else many Singaporean investors will be in trouble. Having said that, the track record of Chinese developers being "disciplined" back home is not that great. This is one of the main reason why China's property market is supposedly entering into its worse slump since 2005. And given that the property market is definitely not as "hot" as it was previously, coupled by the recent curbs on foreign buyers, this is likely to put severe brakes on demand. Despite Tan Sri Lim's optimism (he needs to be given his stake in the project), there are genuine concerns that Chinese developers will flood Iskandar with their products regardless of market vagaries. "I am extremely concerned over what is happening there and teh extent of mismatch between supply and demand. One can't build and say, they will come. What if they don't? There will only be empty buildings, " said Daniele Gambero, chief executive of REI Group of Companies, a Kuala-Lumpur based property marketing consultant. As reported: At 2,217 square kilometres, Johor state's southern development corridor is thrice the size of Singapore; in sports parlance, that is about the size of 400,000 fottball fields. Given these figures, is there really a need to create new land by reclaiming coastal land? And then by building upwards at that? A seasoned real estate executive thinks this ia "an absolutely fair question", saying: "There is huge insanity that's going around for land reclamation. It doesn't make sense, as Malaysiahas plenty of land." No Comment to " Reaction to the latest news on Iskandar... "